The Deadly Deal - click for info! Controls over 60 different pests including: Ants, Carpenter bees, Cockroaches, Crickets, Darkling beetles, Fleas, Flies, Gnats, Moths, Spiders, Ticks, and Wasps. 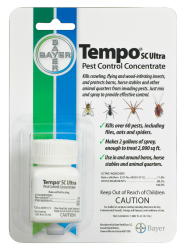 It is a 5th-generation pyrethroid (containing 11.8% beta-cyfluthrin as the active ingredient) that provides the most potent insecticidal activity in a stable, suspension-concentrated liquid. This allows for more even disbursement during application and the active ingredient stays in solution without reagitation. Ideal for: dairy barns, poultry houses, swine houses, hospital pens, veterinarian clinics, livestock housing facilities, horse stables, and pet kennels. 8 to 16 ml treats 1,000 square feet.